The Association of Professional Photographers (АPP) is a non-profit organization, acting in the public benefit and focused on bringing together protection and preservation of copyright and labour rights of the professional photographers in Bulgaria. The APP members are specialists, possessing the necessary technical skills and knowledge to provide high quality photographic services in exchange for decent payment for their work. The APP main goal is to unite all professional photographers into one single organization, to act as a representative body of the guild. Thus APP can define and aid problem solving, as well as safeguard the professional photographers’ interests. In line with this, the Association supports its members in resolving legal disputes on their copyright and related rights. An important goal of the Association is to promote professional photographers’ positive image through involvement in and organizing of public or specialized events, targeted at both the general audience (users of photographic services), as well as the Bulgarian legislative and executive bodies, which can work for the professional photographers’ benefit and protection. We plan to print a calendar, featuring events, such as seminars, round tables, photo exhibitions etc. Through its activities the APP aims at becoming a platform for the exchange of ideas, knowledge and connections between photographers on both local and global scale. The Association aims at promoting and maintaining the good relations with professional organizations in other countries; supporting its members for participation in international forums; facilitating visits, meetings and lectures of world famous photographers in Bulgaria. APP members can only be professional photographers, as well as university students, studying Photography as their major. According to the APP definition, a professional photographer is an individual who earns more than 50% of his/her income from photographic services. Apart from being entitled to certain rights and having access to opportunities, the APP members are obliged to abide by the Association’s Code of Conduct. Thus, they become part of a guild with loyalty, correctness and high quality photographic services being its distinctive features. A guild, setting the course of development for photography in Bulgaria. The Association of Professional Photographers (АPP) was founded with a Constituent Assembly on 26th March 2016. It is being managed by a Chairman and a Management Board. 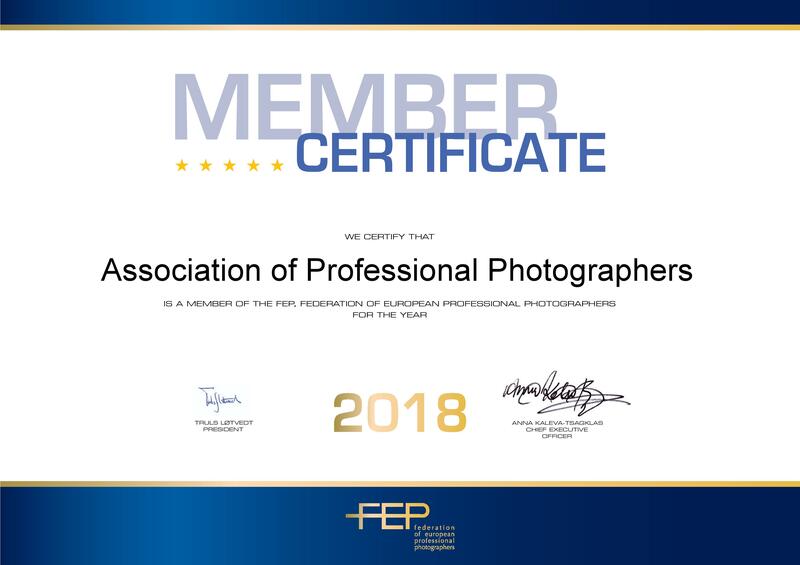 The Association of Professional Photographers (APP) became a member of Federation of European Professional Photographers (FEP) on 26th March 2018.